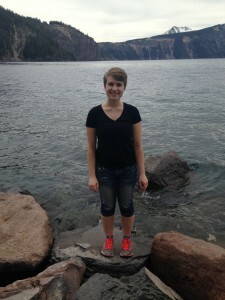 Annelise Marshall is interested in student life and learner engagement. When she’s not in class or working with ESL students she enjoys rock climbing, hiking, reading, and cooking. What is your internship context? This term I’m working with a beginning ESL class at Lane Community College. I’ve spent some time with various classes at the AEI, so it’s been really interesting to be in an environment that’s so different. What is most challenging about your internship? This is my first time working with complete beginners, and it can be very different from working with more advanced students. I’m often able to answer student questions in Spanish, but I’ve had to learn new strategies for communicating with students who speak a language I don’t share. Luckily I’m working with an experienced teacher who is great at working with beginning students, so it’s really been a great learning opportunity for me. What has been most rewarding about your internship? Getting to know the students and seeing them progress. It’s an evening class, so many of the students are older or have full time jobs. They are working really hard just to make it to class, so it’s really exciting to see their work pay off. What are you most looking forward to in your remaining time in LTS? The class of 2016 turned in our proposals earlier this month, so soon we’ll be able to get into the thick of it. I’m looking forward to digging deeper into my topic, and also hearing more about everyone else’s projects.